Classic short stories made accessible with facing-page translations, full vocabulary lists and online audio. This website offers sound files of all seven stories in the book. Download a file and see if you can keep up, reading the kanji at native speed as you follow the text. If you feel really confident you can just listen to the story without looking at the text. Note that audio is provided as a single sound file for Soseki’s Ten Nights of Dreams (Nights 1, 3, 5, 7). Akutagawa’s ‘In a Grove’, ‘The Nose’ and ‘Rashomon’ are much longer and so are divided into multiple sound files. 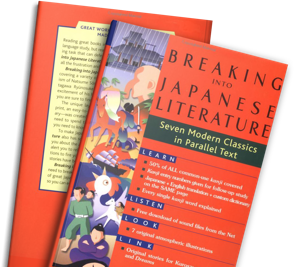 The running dictionary inside Breaking into Japanese Literature provides the entry numbers for any kanji characters that appear in the first edition of The Kodansha Learner’s Dictionary. With the release of the second edition of the dictionary, these numbers are now incorrect. We are working to update this feature in time for the next printing of the book at the end of 2018.